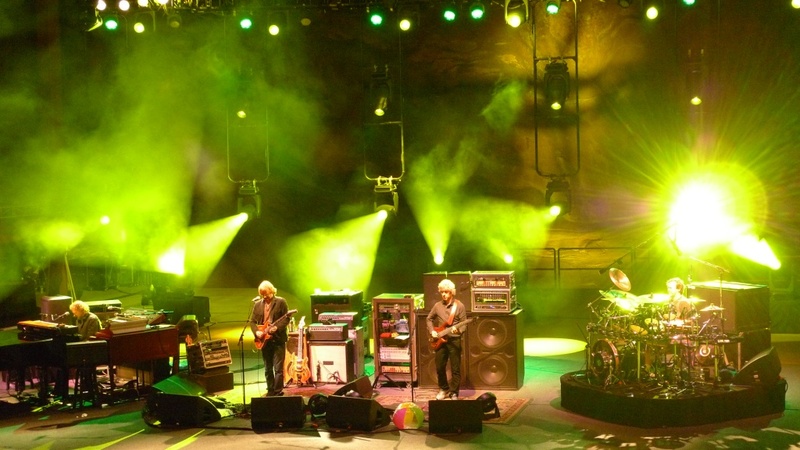 With a wildly creative and utterly unbelievable performance, Phish blew the minds of everyone in the Red Rocks audience last night with a show that so far surpassed anything that has come from this era of Phish, it is like comparing apples and oranges. Only two nights into the second leg of Summer, and it was if we were witnessing a completely different band than we had seen in June. Daring and confident, the band came out of the gates immediately and never stopped. When the dust finally settled, set two took the shape of a gleaming masterpiece, leaving many in awe, pondering what the limitless future holds for all of us. Taking an improvisational high-dive, the band weaved their way between stunning jams, resulting in a peerless tapestry of Phish sorcery. After a first set that climaxed with a terrorizing “Spilt Open” amidst a sudden and swirling rainstorm, everyone waited out a slightly longer setbreak while the weather passed. 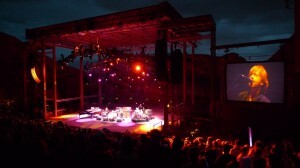 But when it did, Phish took the stage under the clear Colorado sky for a set that will be forever etched in our memory. Spring-boarding into the frame with the newly-revitalized “Drowned,” the band immediately got to business with a hearty dose of full-on improv that took on the feel of a freight train barraging down the tracks with undeniable momentum. Building a full head of steam, the band stretched the classic rock piece into the psychedelic plane, pushing the chugging jam into a percussive groove that segued seamlessly into “Crosseyed and Painless” in the band’s best transition in eons. Igniting the entire vibe of the show with their musical acrobatics, the intensity level of the night was cranked up a few notches as the band attacked the composed section of the Talking Head’s cover with an unparalleled ferocity. 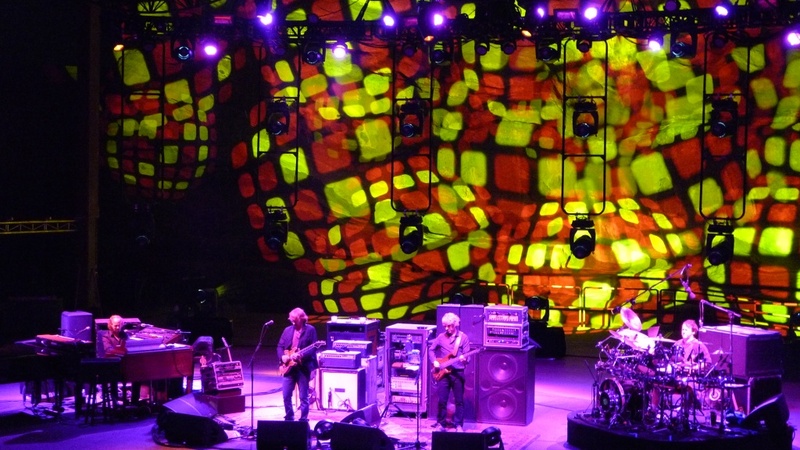 As the band slaughtered the piece, Kuroda introduced some intense new visuals against the backdrop of Red Rocks. Projecting psychedelic patterns which took on the natural “folds” of the rocks brought the already full-on sensory experience to another plane. But when the composition ended, the magic began. 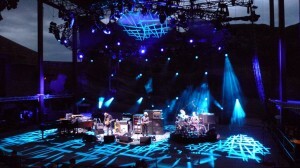 Taking us on an intensely creative journey through several improvisational segments, this “Crosseyed” jam was pure Phish. Taking a piece of music- turning it inside out and upside down- while creating melodic themes and rhythmic tangents; working the jam like Play Doh in the palm of their hands, Phish showcased the masterful communication that defined their past while firmly stepping into the future. Moving more fluidly than we have seen in ages, the band navigated the other-wordly jam with the prowess of a band that is playing not because they have something to prove, but because it is what they do. These four individuals were born to play music together, and now more than ever that is abundantly clear as their destinies have reconvened and set a course for the promised land. After steering through their adventure, the band peaked “Crosseyed’s” cathartic journey with an triumphant section of improv that was enough to set anyone’s heart on fire. “Drowned > Crosseyed”- file that in the “All-Time” category, please. In a set that just kept getting better, the band blew out “Number Line” with a unique melodic exploration that grew far from the song’s base before curving back into the end of the composition- far surpassing any previous version. 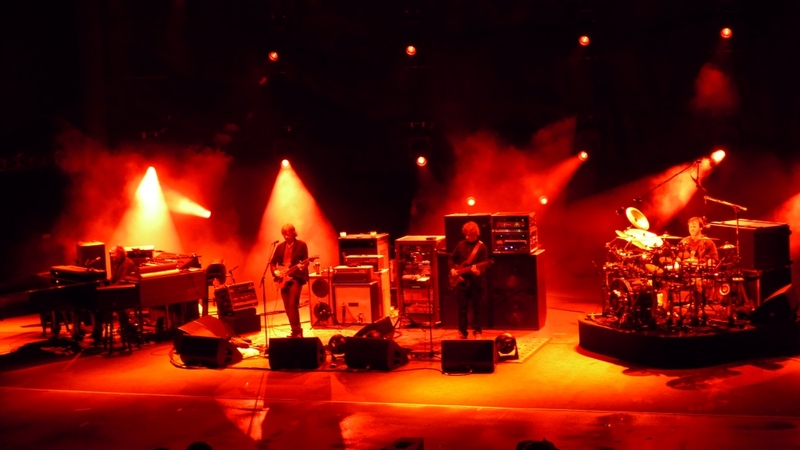 By anyone’s expectation, a closer seemed imminent, so when Phish stepped into the intro to “Fluffhead,” it was another moment that thickened the plot of the engaging musical drama that was unfolding in front of our eyes. 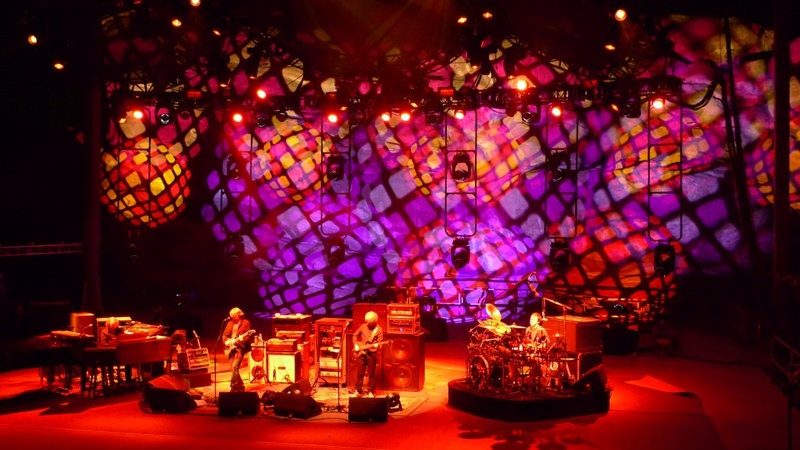 Building huge momentum through the piece, despite a couple of stumbles, the intensity was about to burst during “Bundle of Joy” when Fishman enthusiastically called out the rarely-sung lyrics. And all was released when they hit the “The Arrival” with paramount creativity. Featuring amazing band-interplay this final section transformed into something that had never happened before. 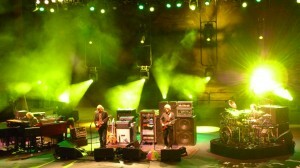 Harnessing the peak of “Fluffhead”- holding and sustaining the absolute top note of the jam- the band, aided by Gordon’s pronounced and rumbling bass, created one of the most unique transitions of the band’s career. Melting the top of “Fluffhead” into the intro to “Piper,” Phish combined the two songs in an unprecedented transition that will send shivers down your spine. Jaws hanging, not knowing what to think, we watched Phish crank up a spirited “Piper,” not knowing where we were heading. 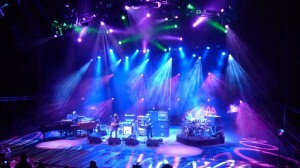 As the band was in the midst of a blistering “Piper” you could see Trey’s mental light bulb spark as he conferred with Mike then Page while maintaining an unparalleled intensity. Signalling to the band where the set should end, they allowed the jam to descend into a piano solo which artistically folded into “A Day in the Life.” Thirteen years after the band debuted the seminal Sgt. 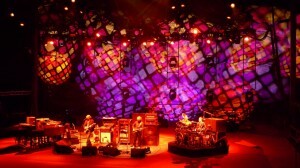 Pepper’s track in the same mystic surroundings, Phish brought the song back to its roots, putting a symbolic and fitting cap on a show that words cannot do justice. A playful “Suzy” encore bled into a bombastic Red Rocks “Reprise” that saw band and audience collectively bask in what they had just created. 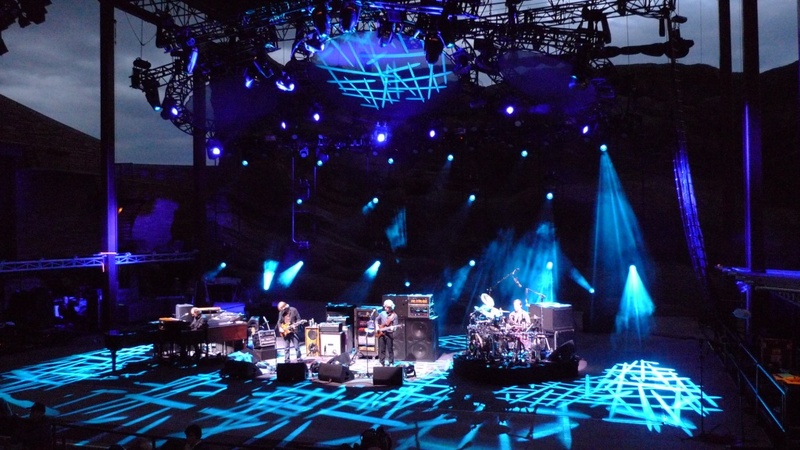 With night like none other signifying an unfathomable future, Phish made even the most most veteran Phish fan feel like they were 19 years old again, unable to contain their excitement for their new discovery. Yes- it was that good. This entry was posted	on Saturday, August 1st, 2009 at 6:05 am	and is filed under Uncategorized. You can follow any responses to this entry through the RSS 2.0 feed. Both comments and pings are currently closed. Esther was average IMO, but then again, they haven’t played the song in 9 years. On a plane from Rome Italy tomorrow afternoon to Boston. On a plane from Boston to San Francisco on Tuesday morning. Shall be jammin’ on the lawn at Shoreline on Wednesday afternoon. Long commute to Phish, but man is it going to be fun. I strongly recommend spending 11 days in Italy and then right to PHISH. Looks like some great music/times in CO. I walked around Rome this evening with the biggest grin on my face…Phish, here I (we) come. @Leo: Thanks again for the info on Italy…we toasted you in Cortona. See ya’ll on the west coast. this SOAMelt is truly legendary. haven’t read all the previous comments, but I’m sure I remember a Fluffhead that jams out into something. something from fall ’94 maybe? or summer ’93? Could not agree more with regards to the second set. 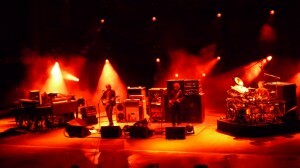 It was definitely the highlight of the 4-day run and easily one of the top 5 sets I’ve ever seen Phish perform. Ironically, I thought the first set was one of the slowest I’ve seen. Powered by WordPress v 5.1.1. Page in 0.654 seconds.